It started with vision. Then arrived fresh sight, seeing what was absent, seeing what was possible. Followed quickly by desire and creativity and know-how and communication and collaboration. 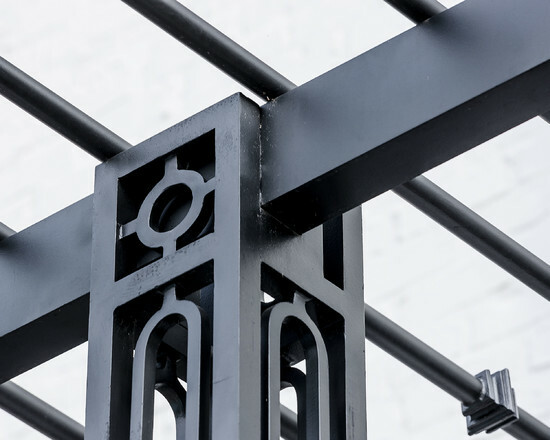 For Exterior Worlds, our design process addressed two main features of the original space—the blank surface of the yard surrounded by looming architecture and plain fencing. 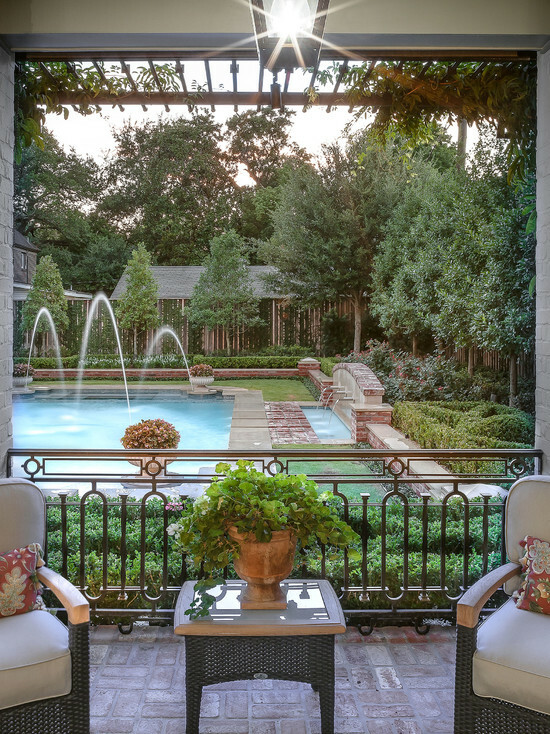 With the yard, we dug out the center of it to create a one-foot drop in elevation in which to build a sunken pool. At one end, we installed a spa, lining it with a contrasting darker blue glass tile. 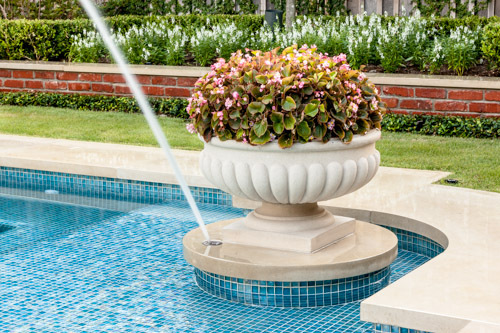 Pedestals topped with urns anchor the pool and provide a place for spot color. 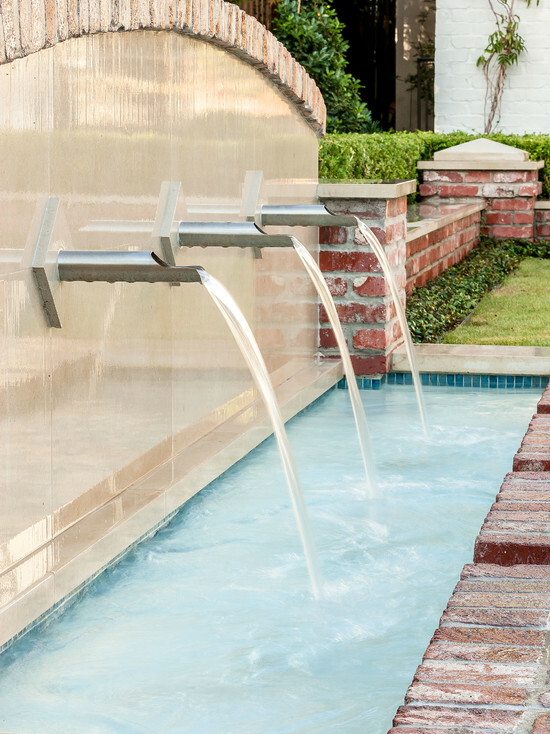 Jets of water emerge from these pedestals. 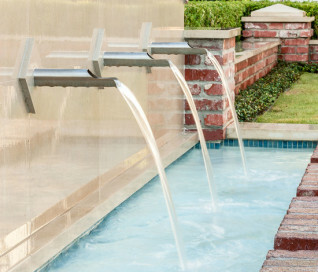 This moving water becomes a shield to block out urban noises and makes the scene lively. (And the children think it’s great fun to play in them.) 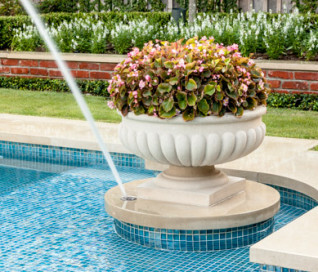 On the side of the pool, another fountain, an illuminated basin built of limestone, brick and stainless steel, feeds the pool through three slots. The pool is counterbalanced by a large plot of grass. 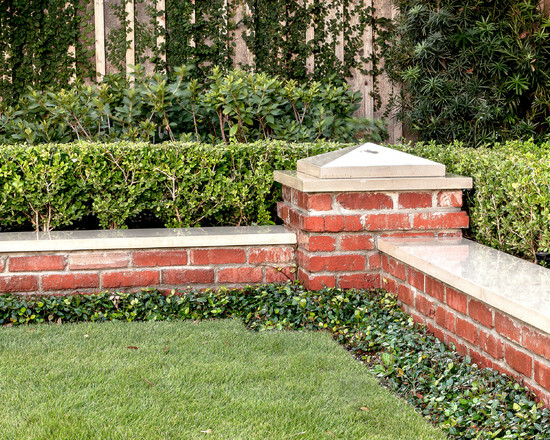 What is inventive about this grassy area is its sub-structure. 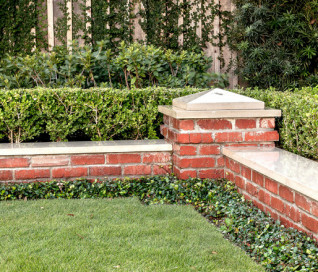 Before putting down the grass, we installed a French drain using grid pavers that pulls water away, an action that keeps the soil from compacting and the grass from suffocating. 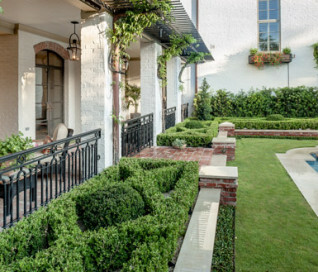 The entire sunken area is finished off with a border of ground cover that transitions the eye to the limestone walkway and the retaining wall, where we used the same reclaimed bricks found in architectural features of the house. In the outer border along the fence line, we planted small trees that give the space scale and also hide some unsightly utility infrastructure. 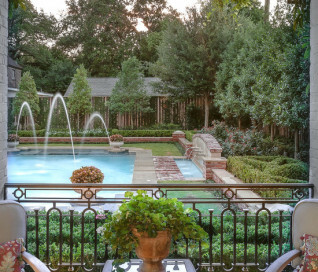 Boxwood and limestone gravel were embroidered into a parterre design to underscore the formal shape of the pool. Additionally, we planted a rose garden around the illuminated basin and a color garden for seasonal color at the far end of the yard across from the covered terrace. To address the issue of the house’s prominence, we added a pergola to the main wing of the house. 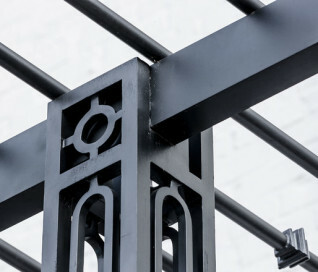 The pergola is made of solid aluminum, chosen for its durability, and painted black. 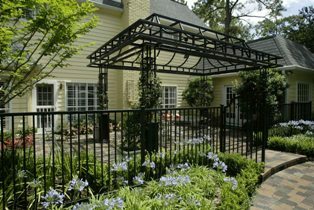 The Ramsowers had used reclaimed ornamental iron around their front yard and so we replicated its pattern in the pergola’s design. 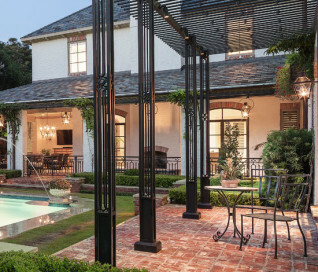 “In making this design choice and also by using the reclaimed brick in the pool area, we wanted to honor the architecture of the house,” says Halper. 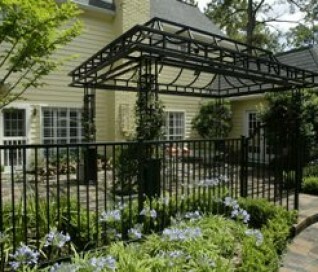 We continued the ornamental pattern by building an aluminum arbor and pool security fence along the covered terrace. The arbor’s supports gently curve out and away from the house. 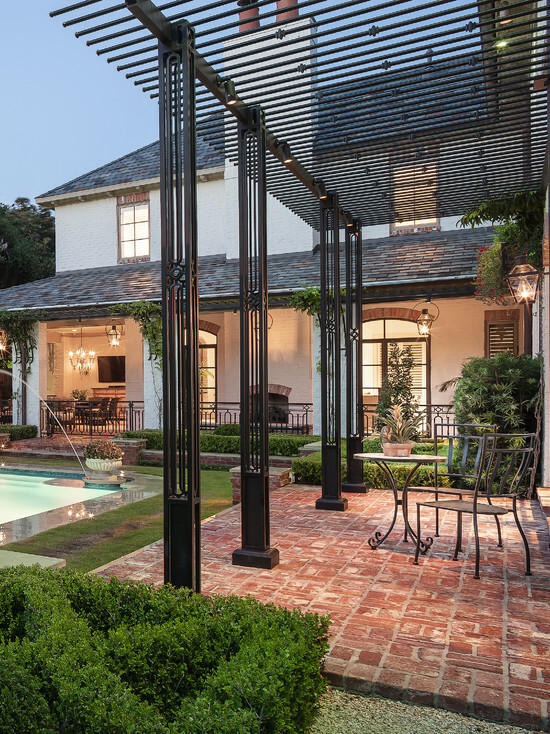 It, plus the pergola, extends the structural aspect of the house into the landscape. 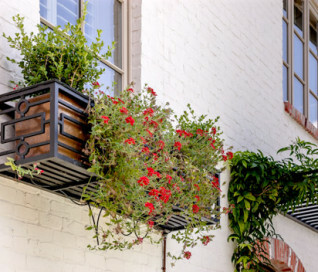 At the same time, it softens the hard edges of the house and unifies it with the yard. The softening effect is further enhanced by the wisteria vine that will eventually cover both the arbor and the pergola. 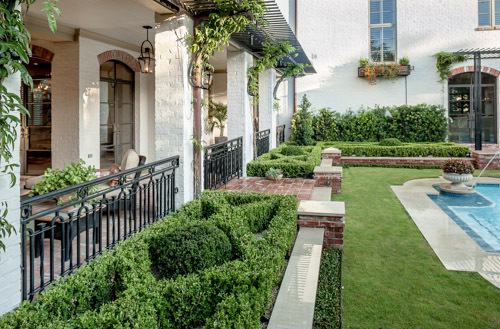 From a practical standpoint, the pergola and arbor provide shade, especially when the vine becomes mature, a definite plus for the west-facing main house. 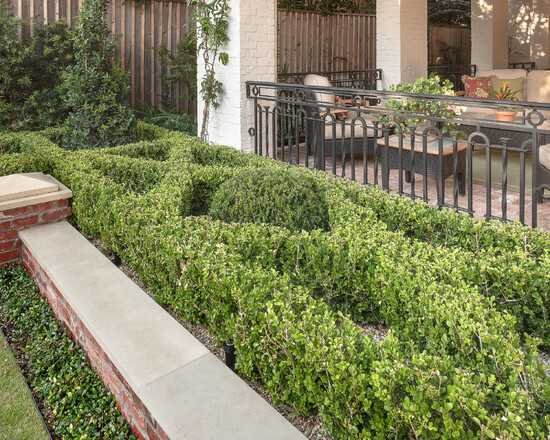 This newly-created space is an updated vision for a traditional garden that combines classic lines with the modern sensibility of innovative materials. The family is able to sit in the house or on the covered terrace and look out over the landscaping. 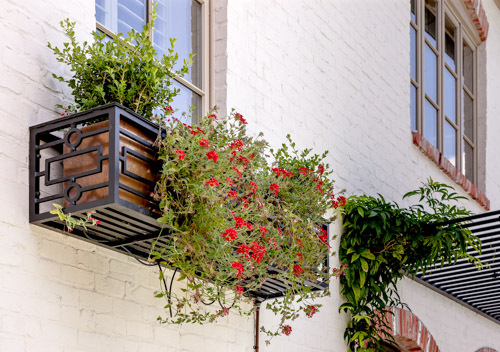 To enjoy its pleasing form and practical function. To appreciate its cool, soothing palette, the blues of the water flowing into the greens of the garden with a judicious use of color. And accept its invitation to step out, step down, jump in, enjoy.